hey crewzin yours looks great too !! 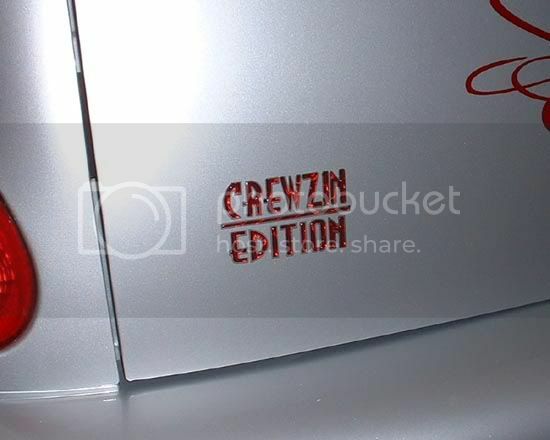 Yes, Crewzin one's are like the original logo...the class ! Only dealt with the company by phone even though I'm about an hour and a half away. The place's name is Zee's Automotive Aftermarket. Number is: 407-461-9222 ask for Lou. STRIKER, by the way, the font used on all PT lettering is called "Downtown". You can see if the place that does your lettering can change the font. Last edited by CREWZIN; 11 Apr 2007 at 06:37 pm. Thanks. I'm gonna call Zee's. Hope you have a GT with Stage 1 to back that sign up.